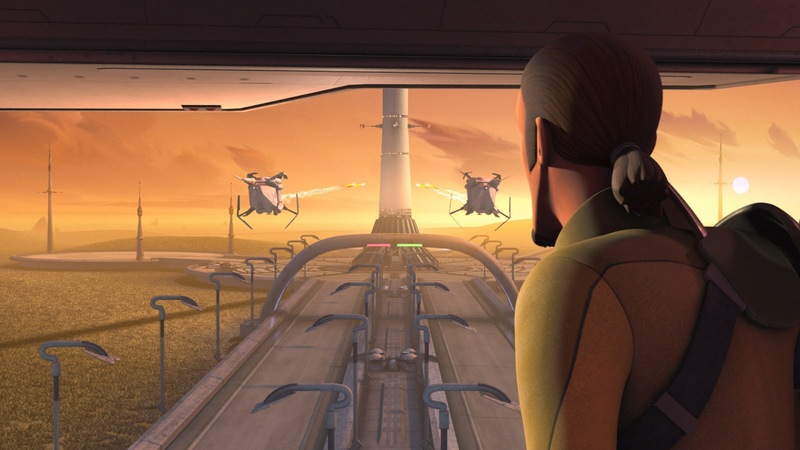 Today we continue our countdown of the Top Ten moments from Season One of Star Wars Rebels, as chosen by SWU readers! Today we look at the shocking climax from the eleventh episode of Season One "Call To Action.". This moment represented a shift in tone for the series. For the first time we saw our heroes having to make complicated and difficult decisions that had real consequences. Kanan's heroics were matched by Ezra following in his parents footsteps and sending out a message of hope to the people of Lothal. We then see the military aptitude of Grand Moff Tarkin who shows that he, unlike some of the Imperials we had met up to this point is willing to do what it takes to win. He even leaves us with the chilling line, "You don't know what it takes to win a war, but I do." This sequence also represented, for me, the first real effects of the new canon and the story group. The sequence on its own is incredibly emotional, however, the scene is made all the more impactful when you understand Kanan's full journey. The Kanan we were first introduced to in John Jackson Miller's novel Star Wars: A New Dawn would never have sacrificed himself in this way. Miller wrote a character who was capable of growth and grew in small ways throughout the novel. When we meet Kanan in the series it is clear that he has continued growing and has come a long way. It was this moment that showed the audience just how much he changed (due in large part to the influences of Hera, Ezra, and the other members of The Ghost crew) in the five (or more) years since the novel and gave the scene an added poignancy. Governor Wilhuff Tarkin makes his first appearance on Star: Wars Rebels, his appearance in this episode certainly made it one to savour, embodied in the climax of 'Call to Action'. Kanan's sacrifice was certainly a poignant moment in the series, as we see him take up the true Jedi mantle and learn the lesson of selflessness; choosing to save his friends instead of himself. He sacrificed himself to one of the iconic villains in the Star-Wars Universe, Governor Tarkin. Governor Tarkin's calculated and resolute approach towards taking down the communications tower bears a shocking moment in the series. His cold and willful iron-fisted approach was visibly showcased to us in A New Hope, with his callous instructions to destroy an entire star system. This nicely contrasted with the imperial officers that had been on show in the series prior to this episode, their clumsy ineptitude had undercut the empire's resolve. The destruction of the tower represented a shift in imperial policy, one that was decisive and ruthless. The audio cues in this scene certainly compliments this notion, as the foreboding imperial march rings in the background, a theme often connoted with the malevolent disposition of the empire and this scene certainly deserved the insertion of that theme. Finally, it is worth highlighting Ezra Bridger's message of hope. The Rebel's fortunes seem to be taking a turn for the worst a this point, as Kanan has been detained and Tarkin has arrived on the scene, but Ezra's speech symbolized a small spark of hope for the rebels. The significance of this moment should not be understated. For me, this scene exemplifies the clash between the imperials and rebels in the Age of the Empire. In spite of the overwhelming firepower and man-power the imperials possess, the marginal insurgents' actions end up causing far greater damage to the empire than the other way round. Ezra's speech inspired other Rebel cells to unite together, which was enunciated by Ahsoka in the finale. This scene certainly deserves to be in the hall of fame for Season One of Star Wars: Rebels.